Best RC rock crawler kits are the one’s that you want to break but they are damn near indestructible. These trucks are scale models of the real life 4-wheel drive monster mobiles. With these radio controlled rock crawlers a day at the beach, the park, or even the back yard becomes the big-time adventure. These trucks come in a range of styles, power, and prices. For those new to the excitement, I would not recommend spending too much on the first rock crawler or a mini rock crawler. But if it is love at first crawl, then there are bigger and better rock crawler that will climb! Since this article is focused towards beginners, we are going to be reviewing only ready-to-run (RTR) kits and not build your own kits. However like any penny pincher, I look for kits that can be upgraded with aftermarket kits, so I’ve included couple of kits that are RTR but need some adjustments. While these are toys, they are not meant for small children. Always pay attention to manufacturer recommendations, but common sense should always prevail. For beginners who don’t want to shell out too much too fast, Exceed is the way to go. They back it up with economic products and their customer service is awesome. This is their MaxStone 10 model that is available in three different scale models (1/8,1/10 and 1/16 mini rock crawler). It has been designed from ground up, and every detail was thought through to provide a competitive level base kit to work with. first off in my opinion this is one of the most affordable RTR RC crawler that has factory built rolling chassis,multi link suspension and axles to all 4 wheels and center mount 3 gear transmission that provides crazy torque. What does all that mean? it means you don’t have to spend months upgrading and rebuilding your kit to make it “safe”to hit the rocks and be competition ready. Secondly, the design is built to support any upgrades, you can switch up the axles,shocks, tires, shell and batteries. That accompanied with reasonable price, this is top kit in my book. Below are some of the technical specs. Upgrades: Basically you can change the whole kit according to your requirements. If you’re new Exceed customer support is super helpful when doing any upgrades, talk to them and they’ll give you pointers. Now onto the big bad boys, starting with a best seller in its class and price range the Redcat Racing Everest. This bad boy comes in electric blue and red, it is jacked up to the nines and it is ready for anything that dares to get in its way. This truck looks just like a real truck in the videos; filming it alone would be an awesome time! It comes with battery and charger, real life like monster tires, with real tread, aluminum capped oil filled shocks, this is like a real truck!Except that the electronics in this truck are waterproof! 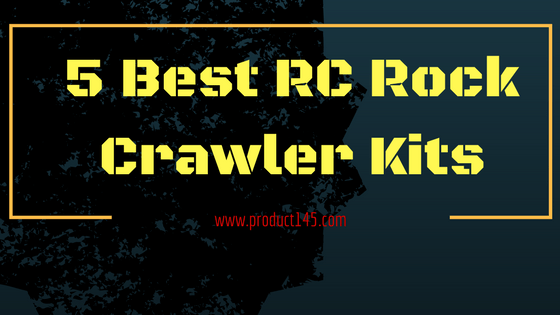 The most expensive on the list (for beginners at least), but the best crawler RC for those who cannot get enough is the Team Losi Night RC Rock Crawler with actual working lights for crawling up and down, in and out of rocky terrain day and night. It features a high torque 35T motor, waterproof electronics oversized shocks, and tires; this truck is a really serious rock crawler. As with a real truck, these need regular maintenance and the tires do wear out, just like on real trucks. It is durably constructed, there is nothing much that will stop this truck. If rugged, solid, fun 24/7 is what you want, this is the truck for you. Losi night crawler upgrades: its one of those beauties that can be molded to your needs, you can change the whole kit according to your requirements. You’re the artist and this is the empty RC canvas! For those looking for that first rock crawler, or maybe just adding to the collection, the Cool made RC Car Conqueror is an excellent choice. This truck is perfect for children between 5-7, after that they may want something a bit more powerful. It will bring hours of fun climbing and crawl its way up anything in its path. As with any battery-operated toy that is in constant use, buy good batteries, or else you will spend more replacing the cheap ones. Just like off-road machines, this truck has independent suspension for ease of handling giving shock-proof maneuverability to protect the inner workings of the truck. The tires have just the right amount of grip for great traction over the steepest of rocks. In all fairness it is 1/18 scale model so it can be considered a mini rock crawler. Along with that it does have few draw backs, you get what you pay for – frame work is mostly plastic, it lacks power and axles and suspensions are mostly cheap. Upgrades: I wouldnt do much upgrades on this model,except for the battery pack. Give the cheap price I would recommend have till it breaks and replace if you need it again. Traxxas is well known for their quality products and many of their products are quite durable as well. As a matter of fact I own this model and I whole heatedly approve this to any one, either for beginners or hobbyists. The Traxxas Telluride 4X4 captures the spirit of off-road adventure.4-wheel drive, specially tuned differentials, and long-arm suspension give it rock crawler prowess. Off the rocks, the XL-5 ESC and Titan 550 motor dish out fast driving excitement. It’s waterproof to tackle water crossings, mud, and snow. The Telluride 4X4 is fully assembled, painted, and Ready-to-Drive. Telluride 4×4 features a shaft-driven 4WD system and the modular design of the Slash 4X4. Telluride’s highly efficient drivetrain offers optimum performance and easy maintenance. A single center driveshaft connects the front and rear drive assemblies for maximum power transfer. The modular design allows the entire front or rear section to be removed with just a few screws for easy service. Upgrades: its one of those beauties that can be molded to your needs, you can change the whole kit according to your requirements. You’re the artist and this is the empty canvas!